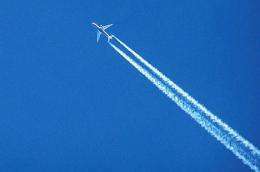 (PhysOrg.com) -- In a recent study published in Nature Climate Change, Dr. Ulrike Burkhardt and Dr. Bernd Karcher from the Institute for Atmospheric Physics at the German Aerospace Centre show that the contrails created by airplanes are contributing more to global warming that all the CO2 that has been caused by the entire 108 years of airplane flight. Airplane contrails are the white clouds that we see in the sky spreading behind jets. These cirrus clouds are created when the hot, moist air released from the plane freezes in the colder and drier air. These clouds then trap the long-wave radiation from Earth and create a warming of the atmosphere. In their study, Burkhardt and Karchar utilized satellite imagery of these spreading contrails to create a computer model which estimates how the contrails affect the Earths temperature. The only difference is that CO2 has a longer life than that of the contrails, and can still continue to cause warming even hundreds of years down the road. The researchers believe that while continuing to reduce CO2 emissions in aviation, more work needs to be done to reduce contrails as well. This reduction of contrails could present an immediate effect on global warming. Solutions for this could include such things as creating flight plans at lower altitudes and the development of new airplane engines which would either reduce the water vapor released or immediately condense the water into ice that would drop to the ground below. Probing Question: Does commercial jet traffic affect climate? Sure provides a good argument for moving moderate length trips to high speed rail. It is not the GHGs that cause the warming. It is the amount of incoming and then reemitted energy photons that limit the amount of greenhouse effect warming. This is proven every night when the sun goes down reducing the incoming energy and the GHE and the temperature goes DOWN, regardless of how much CO2 or water vapor is available in the air to warm things up. The statement that the CO2 lasts for hundreds of years is pure garbage. So does all the GHG water in the ocean. The GHGs can NOT cause warming or generate energy by themselves. (or didn't you ever learn that is basic high school physics)They do NOT create energy. Even my pet rock in the backyard(like all matter on Earth!! )absorbs energy, delays its release to space & results in the daily peak temp being in the afternoon rather than at noon when the peak incoming energy is. The level of stupidity in these global warming "studies" is astounding. "The only difference is that CO2 has a longer life than that of the contrails, and can still continue to cause warming even hundreds of years down the road." Um, that's a pretty major difference. 28 milliwatts for a hundred years vs. 31 milliwatts for an hour. As usual, we have sensational misleading headlines trumping absolutely FALSE claims not supported by the article. CO2 lifetime in atmosphere is 5-15 years. Not hundreds. I believe electric airplanes and jets will do the trick. Wrong. Scientists say greenhouse gases created by humans can last from 100-1000 years. We started adding to the problem back in the beginning of the industrial revolution. The headline gremlin strikes again. As far as I know, the subject of whether contrails cause an increase, decrease or nearly zero change is still open to discussion amongst experts. I wonder what source the people above are using to estimate the total effect of contrails. An electric jet? That's a total oxymoron you know. By definition, a jet engine burns fuel. You would have looked smarter if you had suggested rubber bands I think. MISSING: Global Warming, Answers to the name of climate change, climate, pollution, Greenhouse gas, CO2, witch burning, omen worship, superstition and Disco science and now?..? Continued support of the climate control mistake is hurting the planet, killing respect for scientists and dividing progressivism. How could this unstoppable warming crisis have been real and worth the sacrifice for costly CO2 mitigation, when Obama himself didn't say a single word about the "CRISIS" in his STATE OF THE UNION ADDRESS? Even Obomber is as DENEIR now. Did the saintly scientists put up a fuss? No. Why? you forgot to mention that there's a huge reward if you even bother to look for it, whether you actually find it or not. US House hearings on climate change were held today. The guy from Berkly Earth Surface Temperature gave some preliminary results on their new global temp record. Very interesting testimony. There are transcripts online. Good read. He mentions Anthony Watts' station survey prominently and suggest some kind of new climate-ARPA agency. That sounds good to me. I'm starting to like this Dr Muller. NONSENSE! Aircraft contrails tend to lead to cloud formation, which, in turn increases the Earths albido. By doing so, if anything, they therefore REDUCE the impact of "global warming". Anthropogenic global warming is nothing more than a myth. If you look at the percentage of the greenhouse gas effect (accepting for a heartbeat that there is any proof of the "greenhouse gas effect", that can be attributed to man-made CO2 from all human activities (including human respiration)one finds that it is just 0.117% (USDOE website). That is a completely negligible amount. On the other hand, water vapour contributes 95% of the greenhouse gas effect and of that 99.999% is naturally occurring. This entire debate is a waste of human effort. The amount of research money being sink-holed into it is a travesty and one from which any real scientist should distance him or her self just as fast as they can. There are some uncertainties about this, but the 2007 IPCC report tells us, "About 50% of a CO2 increase will be removed from the atmosphere within 30 years, and a further 30% will be removed within a few centuries. The remaining 20% may stay in the atmosphere for many thousands of years." The only thing you are correct about is when you said "I think." 1: the occurrence of a sudden discharge. 2: an artificially produced flow of water (air in this case). 3: come out in a jet; stream or spring forth; water jetted forth (air in this case). Electric jets sound great and less polluting, too. Forgot to add maybe no contrails or noise? It is not the GHGs that cause the warming. It is the amount of incoming and then reemitted energy photons that limit the amount of greenhouse effect warming. What is wrong with you? In one sentence you deny the effect of GHGs. In the next sentence you mention "greenhouse effect warming". Do you have a PhD in doublespeak? Or maybe you don't even understand what the "greenhouse effect" is in the first place? The GHGs can NOT cause warming or generate energy by themselves. Are you arguing against yourself again, or is there a strawman in the room with you? And that's the whole point of the "greenhouse effect". The more GHGs in the atmosphere, the longer the delay. No, it's the level of self-assured ignorance in your posts. That is why science should be left to scientists. If you really want to comment on something do your homework first. Clouds do both, low altitude clouds cool earth, high altitude heat. Btw the greenhouse gas effect is stronger at night. In fact the change in temperature has been seen more at night than during the day. Clouds during the night trap the infrared radiation from the earth's surface as it cools down. Water vapor is the heating element, CO2 is the thermostat. Water vapor equilibrium is instantaneous on a global scale. CO2's not. The heat transfer outwards of the planet earth is controlled by the outermost layer of the atmosphere, which is the coldest. The outermost layer does not contain water. CO2 there is the prevalent greenhouse gas. A little more CO2 goes far for that region of the atmosphere. It is well established that deniers of AGW will never be convinced by evidence or science. For them, its all about politics and fear of some shadowy government conspiracy. Trying to argue evidence and science with these guys is like talking physics to a child. Trying to point out the awesome ignorance of posters like JDoddsGW and mememine69 is a case in point. It simply doesn't matter what the facts on the ground are. They will continue to deny the evidence in front of them till they are pushing up weeds. @Parsec WHAT? There is little evidence, but many, many computer models, for CO2 causing global warming, or whatever the name has been changed to this week, and the so called "science" has been corrupted by money and a "cargo cult" like religious belief in cAGW. So, when it comes to climate science sic scientific principles have been thrown out the window by the leaders and many practitioners of this cult in favor of fame and endless grant money. You, along with many more have been hoodwinked by these charlatans. Remember, CO2 does indeed keep the planet from becoming a snowball but its ability to add any more warming above 300 ppm is extremely limited because it's absorption bands are nearly saturated. There is simply no way around this first principle because all the feedback systems studied turn out to be negative, not positive. How do you explain that all of the fossil fuels were once CO2 in the atmosphere? Gaia has always taken care of herself. it's absorption bands are nearly saturated. all the feedback systems studied turn out to be negative, not positive. If there were no ongoing carbon sequestration over geological time scales, ongoing outgassing by volcanoes would've turned Earth into Venus a long time ago. There is no such thing as "Gaia". deatopmg - The sun is considerably warmer than it was a few hundred million years ago. If we put all of that CO2 back in the atmosphere today, the earth will be warmer than it was back then, too. And that was very warm and steamy! A further danger now is destabilizing methane clathrates. The earth taking care of itself has lead to some unpleasant consequences - when cyanobacteria polluted the atmosphere with oxygen, huge numbers of species died (of course I am glad that that happened, as I am an oxygen breather myself). GWSwift - Contrails at night are known to trap heat. For contrails during the day, the answer is not yet known. "The only thing you are correct about is when you said "I think." "
I only rated you a 4 because you were wrong about one thing that I quoted above, obviously he didn't think. Another thing I found amusing in the article was the suggestion that flying at lower altitude would help. The main reason for flying at current altitudes is that it is far more fuel efficient. Burning more fuel would mean way more co2 emissions, which since they last longer, would make warming worse. Ah, more conflict. But there is proof to this theory. Immediately after the 9/11 incident, when virtually all air traffic was grounded over the United States, scientists were able to observe lower night time temperatures due to the absence of this artificial cloud layer. This has been widely written about. Of course, the effects are localized. The NE United States and Europe see the most air travel and are most effected by this phenomenon. I remember reading earlier about contrails. Contrails left by planes at day have roughly zero effect, because they reflect both incoming and outgoing radiation. But contrails left by night flying do only reflect outgoing radiation (as there is no incoming). Therefore night flying does have a warming effect. I think they even confirmed this during 9/11 aftermath flying ban, when there were for three days practically no contrails over USA. ROFL , I can visualize a future of Sopwith Camels powered electrically. Everyone owns an electric powered propeller. Go a few 100 mtrs up into the air and then merrily glide over to wherever you want to go. Wasn't this disproved when they did the sky surveys on Sept 11th-14th after the WTC bombing? No jets flying correlated against the temp record on like days showed no significant effect outside of natural variation. As I said, the total effect is still unknown. You are exactly correct, and it is called diurnality. The question is which effect is bigger. Keep in mind that the net effect may not be the same in the tropics as it is in other longitudes. It's a big complicated question. lol. You are too funny. As the word jet is commonly used, it describes a type of combustion engine. What you are talking about already exists. It is called a DUCTED FAN. They are used on radio controlled planes all the time, as well as some other applications. You can still try to call that a "jet" but that is not common word usage. There was a NASA/DoD study to evaluate the concept. Too expensive. There was a temperature change on those days. The problem is that with only one case to study you can't prove whether it was natural variation or cause/effect from the air traffic. We need to just shut down air traffic for a few days again and do it at least once in the Summer and at least Once in the Winter too. Then maybe we can be a little more certain about cause/effect. Since the cost of stopping air traffic for a few days is astronomical, I don't we'll see that study any time soon. Oh well. scratch longitude, insert latitude. I always do that. Electric Jets? I have not found a link, if one exist? Though a magnetic induction electric powered jet motor should work. You really aren't understanding the math here Tabula. There are several problems with your thinking here. I'm willing to assume that one day we will have energy storage of some kind that will make it possible to store more energy per unit wieght than we get from avgas, but we aren't anywhere near that point yet. That's not the biggest problem though. The issue is with air density. If you try to fly at conventional altitudes, then you just don't have enough air density to use a ducted fan design. If you stay low then you have enough air density for the fan, but then you have to fight air resistance too. They looked into using superconductor magnets to drive a ducted fan, but that would require a lot of engineering that doesn't exist yet. The design would have required an internal combustion engine onboard the aircraft to power the magnets and cooling system. Batteries would be too heavy per unit of power to be viable. That's according to the NASA/DoD study. You see, in a conventional combustion jet, you use the power of the combustion to drive a compression fan. With a electric ducted fan you wouldn't want to do that. You would, in stead, just turn your exhaust fans faster. You wouldn't need the compression step in the middle of the engine chamber. It would be better to have smooth flow through the fan and you would be best with only one fan because of internal turbulance issues. Trust me, this was my field of study at Auburn. My brother is an Aerospace engineer too. If you want to see what an advanced ducted fan design looks like, take a look at any of the wind tunnels. There is a supersonic wind tunnel at Virginia Tech that would be a good proxy for what you are talking about. Magnetic induction what? That's silly. You're talking about an ion drive I assume. Maybe when we get to Star Trek technology levels, but I'm talking about real stuff here. Clouds during the night trap the infrared radiation from the earth's surface as it cools down. Yes, water vapor is a strong 'greenhouse' gas. So? A hybrid design is what I have in mind. As far as trusting you, I would rather trust Burt Rutan. I do find your statement interesting. I do not see how there would much difference between a propeller driven aircraft versus an electric jet motor as far as propulsion goes. Noise, pollution, contrails are the points I was trying to make. Reliability, cost, weight are other areas of interest. I do find your statement interesting. I do not see how there would much difference between a propeller driven aircraft versus an electric jet motor as far as propulsion goes. The principle may be the same but the application and function is quite different. In standard configurations the Prop, due to it's shape pulls the rest of the plane forward and the wings provide lift due to air pressure...and so on and so on. With Jet engine design the gas is packed into the combustion chamber then expanded via rapid heating with fuel combustion, providing thrust, or a push from the exhaust of the engine. This is a very basic overview. GSwift would be more able to go into further detail. The Prop, due to it's shape pulls the rest of the plane forward and the wings provide lift due to air pressure...and so on and so on. I imagine an electric jet motor could do the same, but push instead of pulling. Am I missing something? I see GSwift's point, but now I am taking about the range within propeller driven systems. Yes. Jet engines work based on gas compression. You would have to tell us how this would work in your design. Turbine is another word that would be more appropriate for the time being. Jet is a word I find more intriguing! Now, how could electricity be used to replace a jet engine with an electric powered jet turbine? Turbine is another word that would be more appropriate for the time being. Jet is a word I find more intriguing! You seem to find a lot of things intriguing. You should do some reading and satisfy that intrigue. It will make further interactions with you more beneficial to you and whoever you are interacting with. Contrails have a measurable day time albedo effect. There was an article in Scientific American Magazine a couple of years ago I think, and I have also seen this discussed in TV documentaries. A definitive demonstration of contrail Albedo effect occurred - by dint of its absence - in the three days [or so] after the destruction of the Twin Towers . A weather science measurement called the Pan evaporation rate was found to have increased significantly throughout the USA. After allowing for all the other possible effects [wind speed, air temp, etc] it was found that the one thing that correlated exactly with the observed USA wide increase in evaporation was the reduction in shade provided by contrails. Paradox, it was found that the variation over the night time had a relatively equal heating effect at night. The total impact was considered negligible. Sure, whatever you say. You are always so perfect. I love God and you hate God. So you are going to follow me around everywhere I go ranking me 1 out of 5. Whatever. Go pick on someone else! Physorg.com had a recent article about compressed frozen air, H2O or something like that. That may be where the jet stuff could come into play regarding electric jet turbines. Sure, whatever you say. You are always so perfect. Why do I have a feeling this is going to go right off the rails. I love God and you hate God. No, I don't, but the entire topic is irrelevant. Reading about things that interest you, rather than just being interested is how one learns new things. So you are going to follow me around everywhere I go ranking me 1 out of 5. I've ranked 1 of your posts in total as far as I can see in your activity log. Whatever. Go pick on someone else! If you think someone encouraging you to learn new things is 'picking on you' well, I really don't even know what to say to that. Paradox - yes, 9/11 was an interesting unplanned experiment on the effects of contrails. However while the night-time effects are well known (all on the warming side), the daytime effects are much more complicated. Just as with natural clouds, contrails have both cooling and warming effects during the day. Just as with natural clouds, the relative sizes of these effects depend on many factors (altitude, lattitude, temperture, humidity, other clouds, albedo of the ground, etc.). Thus while 9/11 strongly demonstrated that contrails over the U.S. during the day in September are cooling, the more general answer is not yet established. I love God too and I'm the one ranking your posts 1 because you're saying stupid s***...Cheers. All I have got to say is stop blowing your smoke and radiation in my face. Why do you think I am talking about electric jets? The answer is in an attempt to cut down on air pollution. The second reason is to cut down on noise pollution. The third reason is to make stealth jets more stealth by removing contrails and heat signatures. I see you have missed by point. You must really like shooting yourself in the foot. Is that why you picked that handle? "not only does volcanic CO2 not dwarf that of human activity, it actually comprises less than 1 percent of that value." An electric jet? That's a total oxymoron you know. By definition, a jet engine burns fuel. Anyway, electric aircraft are possible through the use of solar panels. A group in Europe did a 40 horse-power electric airplane several years ago which was able to stay in permanent flight in a restricted air space for over 24 hours, and presented at landing time with a net gain in stored energy in the batteries. Admittedly, this WAS a one-man aircraft, however. The point here is that you could use solar powered helium airships, and while they won't be quite as fast as aircraft, they will be far, far cheaper in the long term and have virtually zero carbon footprint. Bouyancy provides all of the lift with zero fuel cost, and then Solar provides your "thrust" through electric props. This is probably the most energy efficient aircraft concept imaginable. "...not only does volcanic CO2 not dwarf that of human activity, it actually comprises less than 1 percent of that value." See what I did there? I used a credible source, not something I once heard Rush say. Yeah but the loss of speed and control issues inherent with dirigibles makes this an unattractive alternative. Solar and/or Liquid Air powered? Always "computer models"...these piece of technology can give you whatever you want but that does not mean it is TRUE! The faster you want to go, the faster you have to turn your fan blades, whether they are inside of a duct cowling or open air propellers. When you get fan blades moving really fast, the outer tips move faster than the inside radius. When the ends of the blades are supersonic and the center isn't you get all kinds of problems with pressure and shock waves. It becomes a nightmare of efficiency problems and stress problems. The Vietnam era helicopters make that chop-chop sound because of that effect. The rotor ends are supersonic and fighting the presure constantly. Notice that newer helicopters don't make that sound and don't have that long two blade design. That is not accurate. A (sc)ram jet burns fuel. It takes in oxygen from outside and compacts it mechanically before mixing with fuel for combustion. The WW2 buzz bombs made that buzzing sound because of the opening and closing of their fresh air intake doors. They were a primitive example of a (sc)ram design. The sc part is just a modern advance of ram technology. The difference between that design and a standard turbine is not the fuel, it is the method of compression prior to ignition. The (sc)ram just doesn't have the intake compression fan, which simplifies the design and cuts down on moving parts as well as improving air flow characteristics inside the combustion chamber.